«As soon as the scale of the accident became clear, the management of AZMOL British Petrochemicals at the official level decided to provide any possible assistance to the city. All employees of the Azmol, being not only residents, but also patriots of Berdyansk, were ready to work tirelessly, only to restore the normal water supply to the city more quickly. The main areas of work were identified - prompt supply of water to citizens and assistance in eliminating the accident. “We are well aware that the launch of the water will not be fast, besides, the collector is in a terrible condition and people need to stock up on water,” Vladimir Pivovarov told us. But the main task was the installation of a bypass pipeline bypassing the damaged section, which was assigned to the Azmol repair and mechanical workshop staff. The work lasted around the clock throughout January 30-31, 2019 and took place at two sites: in the workshops of the Azmol plant and, in fact, at the accident site. In the workshops of the plant, the pipes were prepared and welded in two parts of 6 meters for faster installation at the site of the accident, and then sent directly to the emergency site. 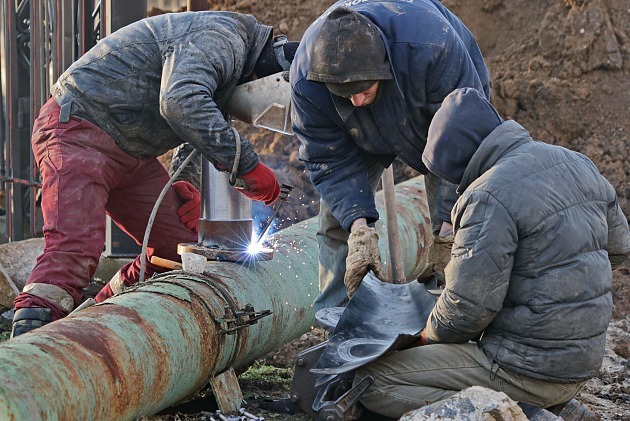 - The preparation work in the workshops lasted from 2:00 pm on the 30th until 5:00 am the next day, and direct installation began at 7:00 pm, as pumps from Kiev waited all day, which began to be connected immediately upon arrival, - says Vladimir Pivovarov. - Experts RMM company AZMOL British Petrochemicals carried out the installation of the knee in the water and under the unceasing winter wind. The work went on all night and was completed only by 10 am on January 31. As a result, the work at the two sites took more than a day without a break. It was prepared and laid about 250 meters of the pipeline. “The Azmol is ready to help Berdyansk in any situation,” the company's management says. - We are grateful to our employees for their position and care about everything that happens in the city», the publication said.